Next to Mountains, Rivers are one of the most important land features. Rivers have a direct effect on life around them. 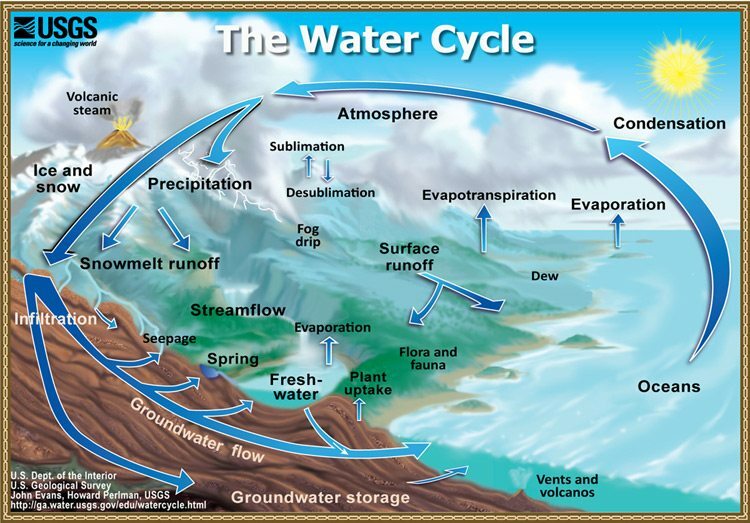 They are part of the hydrologic cycle process and often carry water from its source to another body of water, such as from a mountain to an ocean. Up until now, we’ve designed where deserts, mountains and forests will go. 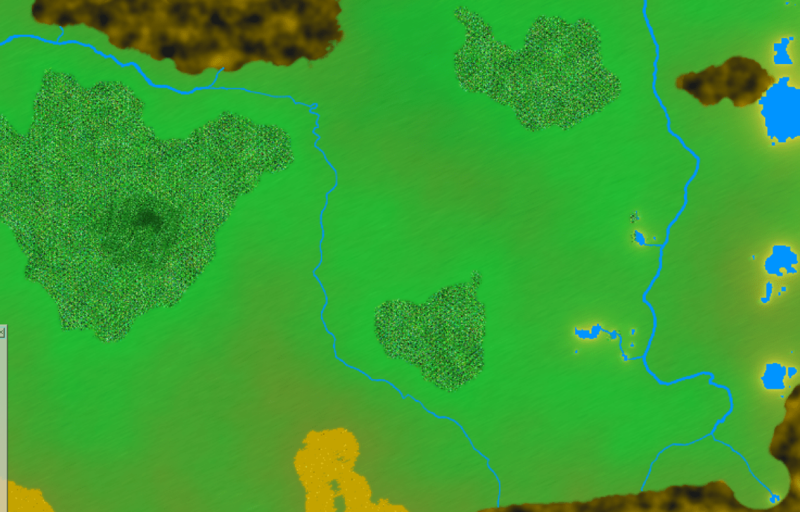 Now with Rivers, we know where they need to be drawn in order to facilitate all the geological features. 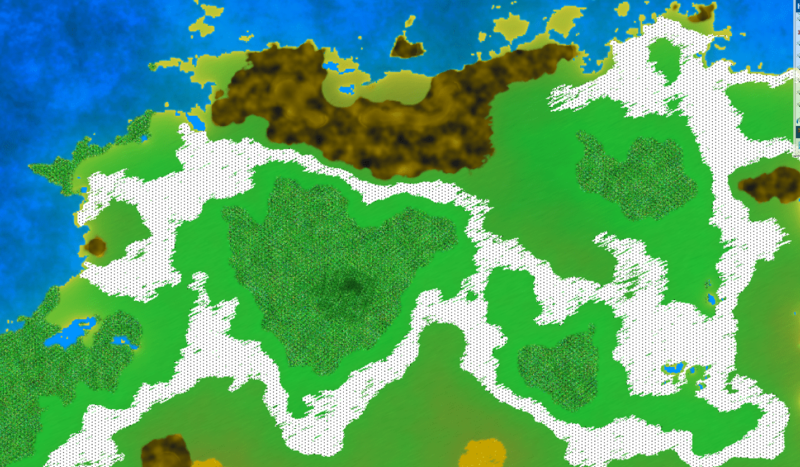 Rivers come under a lot of scrutiny for worldbuilding. People often design rivers with no understanding of their function. Common mistakes people make is rivers starting from random places, rivers going up hills and mountains, rivers going up other elevations, rivers connecting from one ocean to another, and rivers splitting off in multiple directions. 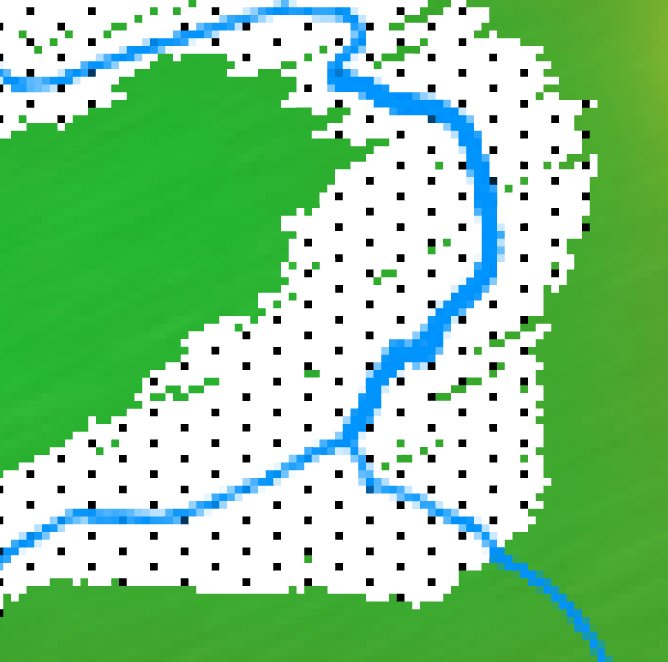 While rivers going up elevation is impossible (unless magic is involved), rivers starting from random locations and splitting off is very uncommon. It’s best to remember, that rivers are controlled by gravity and follows elevation downward, meaning that if the elevation is going down, the river is going down and won’t go back up. Rivers also exit into oceans, and for the ocean to make a river would go against water moving uphill. Rivers splitting off is uncommon. It is called River Bifurcation. Basically a river breaks into two and goes two separate directions. 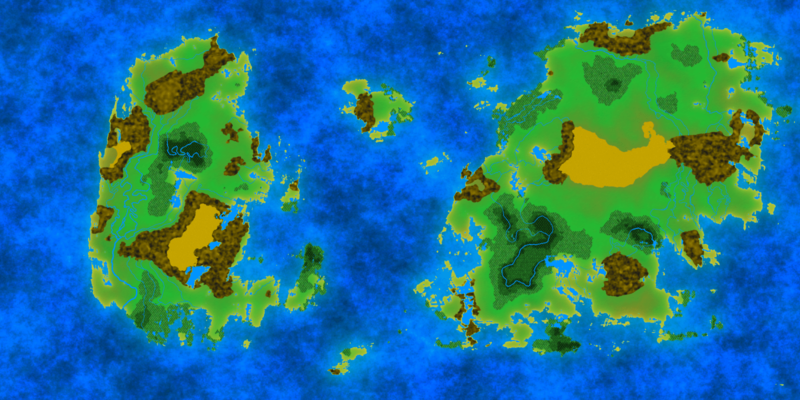 Now if the streams merge again or connect to the same body of water, this create a river island. When Bifurcation forms, it tends to be temporary, as the water will eat away at the soil and destroy it. Might take a long time, but it will. There can be permanent bifurcation, but generally involves a dense material such as volcanic rock, or man made construction. Best advice, don’t do it that often, once or twice is OK. Every single river… NO! A good example of this is deltas. Another major mistake people make is the Top/Down Bias, or the North is Up Bias. Many people assume that rivers above the Equator only flow from north to south. In America, we have the Mississippi River to thank for that thinking. However, there is the Nile River, that flows from South to North, and that is still north of the equator. We won’t be looking at lakes or wetlands today, though wetlands may come up in a future article. The key feature of a river is that it is freshwater. It is important to remember that flowing water tends to be freshwater. It is estimated that 85% of drinking water comes from rivers. A river is a natural watercourse, that starts from rainfall from a mountain (generally), creating a stream of water that flows to an ocean, lake, or another river. There are rare cases that a river will end without touching another water source and dry up. However, doing that will cause scrutiny amongst map makers. Water in a river is usually confined to a channel, made up of a stream bed between two banks. The area next to a river is called the Riparian Zone. Riparian Zone has no official definition and this leads to a lot of confusion. I am going to simplify it to make it easier for this tutorial. Riparian Zone is the area right next to the river itself. When it comes to rivers (as wetlands is basically one large Riparian Zone), there are two types, Riparian buffers and floodplains. Generally the difference between the two is the size of the river. Larger rivers tend (not always) have floodplains. Smaller rivers tend to have Riparian buffers. 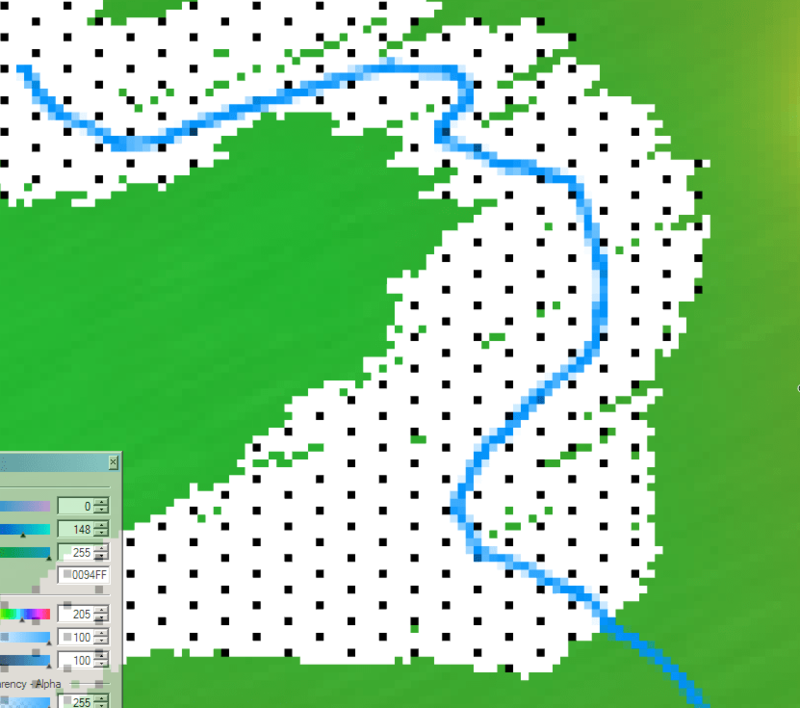 Riparian buffers is when you have a forest, or vegetation, biome intersect with a freshwater biome. 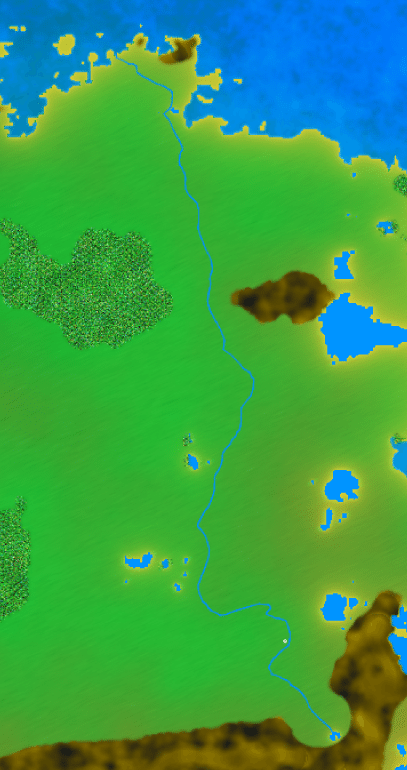 This can be seen with small rivers traveling through forests. Floodplains are for rivers that have flooding. With flooding, rivers rise up and cover more ground than the river normally does. Because rivers carry sediment in its channel, it will spread this sediment onto the land, and as the flood reduces, the sediment remains. Over time, it become floodplains. Both types of Riparian zones can help with flooding prevention, assuming that these areas are not cultivated for human use. Often times civilizations build in these areas, especially floodplains for access to fresh water, fertility of floodplains for farming, cheap transportation via rivers, and ease of development due to flat land. Of course, floods are one of the worst natural disasters that a civilization can face. Most rivers flow on the surface. There are a few that flow in mountains or underground. These are called Subterranean rivers. These kinds of rivers are normally found in regions with limestone geologic formations. Rivers are generally classified as either alluvial, bedrock, or some mixture of the two. We’ll go into a greater discussion of this later this month, but a brief of what they are. Alluvial are rivers that have channels and floodplains that are self-formed. Bedrock rivers form when the river downcuts through modern sediments and into the underlying bedrock. Light – How much light can penetrate the water and how deep it goes. This will affect plant life. Seasonal lights also have an affect. 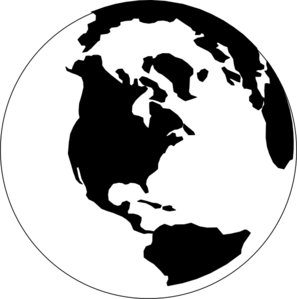 Temperature – Climate for the area will affect plant and animal life. Chemistry – Generally influence by the type of geology the river flows through, it is the makeup of the river itself. Ecology of rivers is very important. They provide freshwater and food. Food itself needs food. Thus we have the food chain like anywhere else, starting with plants or bugs that are eaten by birds, mammals, and amphibians. Also during the seasons where leaves fall off trees, rivers can take dead leaves and provide nutrients to rivers. Taking away a forest in an area can affect local plant life. I can go on about rivers, but I want to move onto the lesson plan for today. The trick is to choose the area between dark green and bright green. I often see dark green as being less fertile land and bright green as being more fertile. This should, with your magic wand, draw a shape around the bright green area. e. Not doing anything else, click on the Paint Bucket tool in the Toolbar. g. With the Paint Bucket, click inside the selected area. This looks rather weird. This is the path your river will follow. We start at a mountain, lake, or forest, and draw to the nearest black dot, and follow that path. 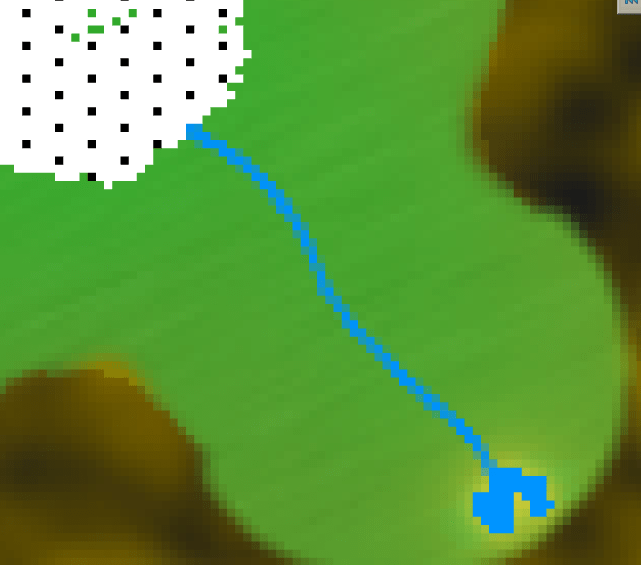 Since this is our first line, we don’t have another river to connect to, so this first river should connect to a lake or an ocean. Remember that it is uncommon that rivers are straight, so try to follow the path as best as you can not going outside of it, unless you need to. d. Start your line from a mountain and draw to the nearest dot. Be sure to let go of the mouse from time to time. If you mess up and undo, it is better to redo part of it rather than the whole thing. After you are done connecting your river to a source of water, turn off river placement, and take a look at what you did. Now, how organic does that look? 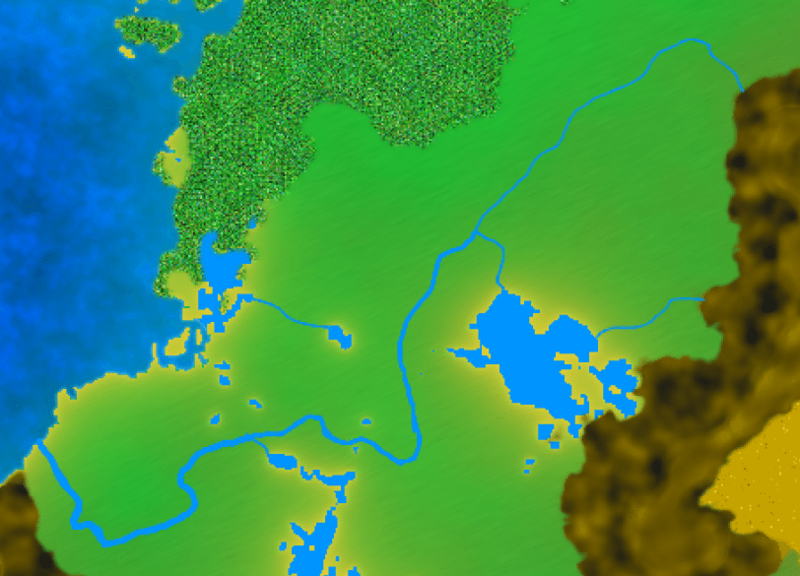 With my one river, I have some lakes near it, that I think that a few rivers from those lakes should connect to my new river. a. Start from a lake and draw either to another lake, or to the nearest dot. b. If you did to another lake, then draw from that lake to another lake or a dot. c. If you draw to a dot, then draw to the nearest river. Continue drawing rivers as many times as you want. Once you connect to a river, you are done, move onto the next one. Tip: Hug the curves and try to go between green dots. b. Go to where two rivers meet. Essentially, with two rivers connecting together, we get a bigger river. Don’t worry if you don’t precisely draw over the brook, that part of the fun. If another river connects to it, or a lake, don’t worry about it for now. Do this for all your rivers. b. Draw over the river that has a 3rd brook connecting to it. Same thing as before. As you have more rivers connect to your rivers, you can increase in your level of thickness. 3 is a good number, 5 is OK to do, but 10 is an extreme. No higher than that. Also, just because another river connects to it, doesn’t mean the river gets bigger. 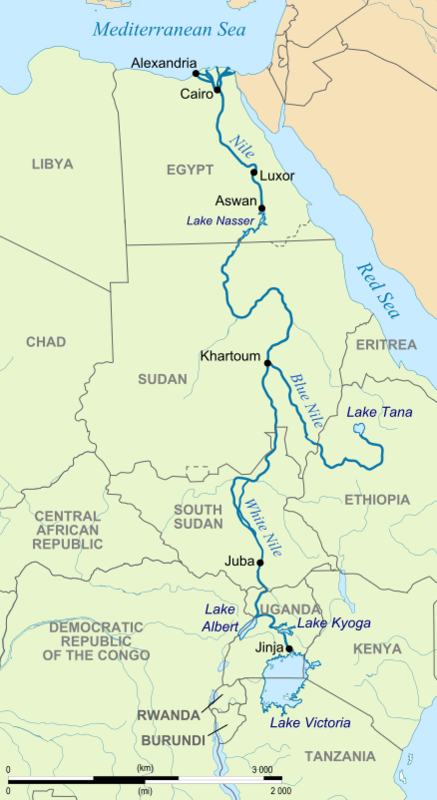 Consider the Nile River, that there are many tiny rivers that connect to it, however, it gets the vast majority of its water from the White Nile and the Blue Nile rivers. While the White Nile comes from really big lakes, it does travel a long distance. Because of this, 85% of the Nile’s water, comes from the Blue Nile. Bigger lakes tend to mean more water, but rivers over a greater area tend to mean less water over greater distance. Unfortunately, I ran out of time this week, so I don’t have a completed picture of my rivers. When I do, I will post it in this tutorial. As you can see, this is a very time consuming activity.